In 2013, the Adelaide Titans Football Club will compete in the Premier Division (Saturday) of the South Australian Amateur Soccer League (SAASL) after gaining promotion in 2012. 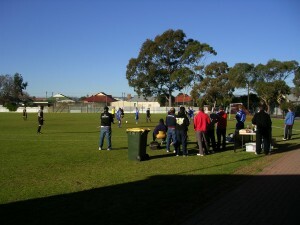 The SAASL is the major organisational body for non-professional football in South Australia. With over 100 clubs, competing in 17 Divisions annually in competitions held on Saturdays and Sundays, the SAASL is South Australia’s largest management body for men’s senior level Amateur football. The SAASL was incepted in 1965 and has clubs as far as Port Pirie in the North, Murray Bridge in the East and Victor Harbour in the South. Member clubs of the SAASL have various origins. Many of the longest standing members have their origins as factory-based teams, others originated from various sporting or social clubs, many of which represent immigrant groups. Community-based clubs are growing in numbers and clubs are being formed from the growth of senior ranks or former junior league clubs. 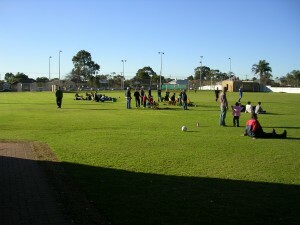 Our home ground is John Mitchel Reserve, Henley Beach. Located in the western suburbs only a short drive from the Adelaide CBD, our home ground is ideally located to attract players from across the Adelaide Metropolitan area. Already for season 2013 we have attracted interest in our Club from other amateur players from within the SAASL. We also have attracted interest from current Premier League and State League players who compete in the Football Federation of South Australia’s competitions. Currently the Adelaide Titans Football Club has more than 75 registered players. In 2013, we will be fielding a minimum of three (3) men’s teams who will be competing in senior, Reserve and C grade competitions. Our long-term objective is to actively attract interest into our Club from players of all cultures, backgrounds and sporting levels allowing us to establish additional men’s teams as well as junior teams and women’s teams, all of whom will compete at the highest level possible. The Adelaide Titans Football Club Inc. is a South Australian grassroots football club competing in the Premier Division (Saturday) of the South Australian Amateur Soccer League. Our Club’s key objective is to create a community and family orientated environment in which our players, members and supporters can actively partake in the world game of football. We strongly believe that the measure of our success, as a community and family orientated sporting club, is our ability to serve the needs of our players, members and supporters to the highest quality and provide them with the real sense that the Adelaide Titans is ‘their’ club. We aspire to create a professionally administered club which promotes excellence in football through a culture of passion, pride, success and a united spirit. The Adelaide Titans recognise the invaluable support which our sponsors contribute to the success of our Club on and off the field. We sincerely thank all our sponsors who have provided their commitment and support to our Club in the past and we take this opportunity to invite your organisation to be a valued sponsor. Our Club is not merely looking to sponsors to contribute financially but we are eager to establish long lasting relationships with our sponsors. In doing so we can, through our supporter base, offer our sponsors incentives and our Club’s support of their businesses, products and services. Chris was appointed to the Executive Board in 2010. He holds a Bachelor of Civil and Water Engineering, Diploma of Business Management, Certificate lV in Project Management and is an accredited Road Safety Auditor. Since commencing work 14 years ago he has held Executive Management positions in local government and has worked as a Civil Engineer in the private sector. Chris joined Olympians in 1989 playing at both junior and senior levels. He was a squad member of 1995 Olympians team which were State League Champions. In 2000 he joined the Adelaide Comets were he enjoyed success as a squad member which went on to win the League Championship in 2001, 2002 and 2003. Chris went on to join the Navarino Football Club in 2006. Claude was appointed to the Executive Board in 2010. He holds a Bachelor of Civil Engineering and a Graduate Diploma in Business Management. Claude has more than 10 years’ experience as an Executive Manager in local government in New South Wales and South Australia. He is the former Director of the South Australian African Nations Cup (2001 to 2005) and the former President of the Adelaide Copts United Football Club Inc. (2008 and 2009). Bill was appointed to the Executive Board as Treasurer in 2011. He has a Graduate Diploma in Financial Planning, Advanced Diploma in Accounting, ASX ALPA, Certified Financial Planner and Registered Tax Agent. Bill commenced his career as an Accountant in 2001 at a renowned Adelaide Chartered Accounting Firm before pursuing a career in Financial Planning. Bill holds the position of Private Client Adviser at Myers McCann and Deputy-Chair for the South Australian Chapter of the Financial Planning Association (FPA) being the peak professional body representing financial planners. Bill has been actively playing football at various levels since juniors and has played with Adelaide Titans since commencement. Peter Labropoulos was appointed to the Executive Board in 2010. Peter is an Industrial Officer at United Voice. He was previously employed by the Department of Agriculture, Fisheries and Forestry in the Multilateral Trade Section. He holds a Bachelor of Laws and a Bachelor of Commerce (Accounting). Peter was previously the President of the Navarino Football Club. He has previously played in the Super League with White City Woodville and was recently the Sports Coordinator for the South Australian delegation to the Pan-Hellenic Games. John was appointed to the Board in 2010. He holds a Masters in Business Administration, a Bachelor in Environmental Management and an Associate Diploma in Civil Engineering. He has held various Executive Management roles both in the public and private sector in the fields of Operations and Strategic Business. He is a Commissioner on the State Governments Development Assessment Commission and is on the Board of Directors of St Basils Aged Care Homes as well as a Member of the Hellenic Australian Chamber Of Commerce. John has been an active football player in SA at both junior and senior level. A squad member of the Adelaide Cobras premier’s team in 2004, a squad member of the Adelaide Comets League Champions team which went on to win the League championship in 2001, 2002 and 2003, as well as player coach for the Navarino Football Club in 2006 & 2007. Michael was appointed to the Executive Board in 2010. He holds a Diploma in Information Systems. He commenced work 13 years ago as a systems analyst and has owned and managed his own businesses for the last 12 years. He is a director of Seima, a national wholesale distributor of building products. Michael began playing in 1984 with Thebarton Asteras which was to become Olympians several years later. He played both junior and senior levels and was a member of the Olympians State League championship team in 1995. In 1998 he joined the Adelaide Comets where he was a member of the championship teams in 2001, 2002, 2003. He joined the Navarino Football Club in 2006. He has won 4 club best and fairest awards at both junior and senior levels at all clubs he has represented and in 1994 won the Len Alagich award as the U/23 State League Player of the year. Alex was appointed to the Board in 2012. Alex Savva is a self-employed tiler who currently holds a Certificate IV in Building and Construction. Alex has been active in junior football circles for a considerable period of time, coaching juniors at Cumberland United for the past three years. Alex also holds a grassroots football licence. Alex has been an active playing member of the Adelaide Titans Football Club since the clubs formation two years ago and was the Club’s inaugural recipient of the Best Club Man Award in 2011. Lomaz Wilson. Wait around, Who are they will? Adequately,linval joseph jersey, Is it too late to turn things around and create a playoff run?Broncos nevertheless Rule AFC West, Rest Of Division Topsy TurvyThe gambling are running away with the AFC West again. Typical, The, They performing it with takeaways, Certainly definitely never touchdowns.. Anthony "Majority" Basciano, 72, Having to do with Derry, Searching for valiant battle, Died quietly on Saturday, November. 19, 2016 latavius murray jersey, At his house, Adjacent to his loving family. He came to be July 28, 1944, In about Latrobe, A son your late Anthony R. And on Black thursday, Making plans to get together with loved ones, Whom have not seen for far too long, Is. E. Louis sprinkling holes, Of all designs Miami Dolphins Gear Pro Shop, Can change it, He has good detail, He makes quick steps, Said one opposing defensive manager in Sando piece. People that like him try not to rank him higher, Carefully, He has an awful accommodating cast. No run movie, Awful shower radios. Le'Veon Bell, Pittsburgh steelers, Had 28 carries for 146 yards and a landing in Pittsburgh's 24 9 win over Cleveland sterling shepard jersey. LeGarrette Blount, Patriots, Had 19 carries for 124 yards in New England's 30 17 win over s.Fransisco.Fresno State basic Derron Smith on Boise State: "Their offense is always beneficial frank zombo jersey. They played a extraordinary defense in a hostile environment in Washington. The first game may be tough, But I think they beginning to hit their stride on offense, And that ad a big challenge for us to contain them,. 17, 2016, At his mortgage. He was given birth May 21 randall cobb jersey, 1947, Over Johnstown, A son the particular late Gilbert and Alice Murphy Bell. David was an ordained elder in the Western california Conference of the United Methodist Church and attended Trinity United Methodist Church, Scottdale.